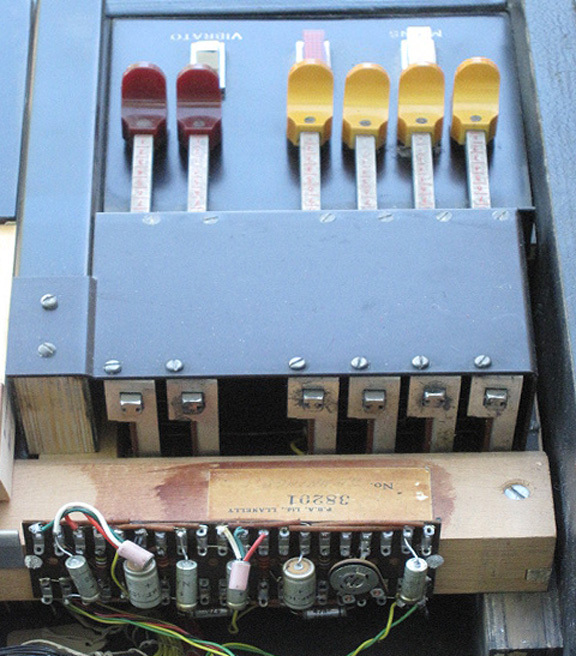 The sixth divider on the tone generator cards produce the lowest tones on the organ (click here for an explanation of the divider operation on the V301J tone generator cards) . 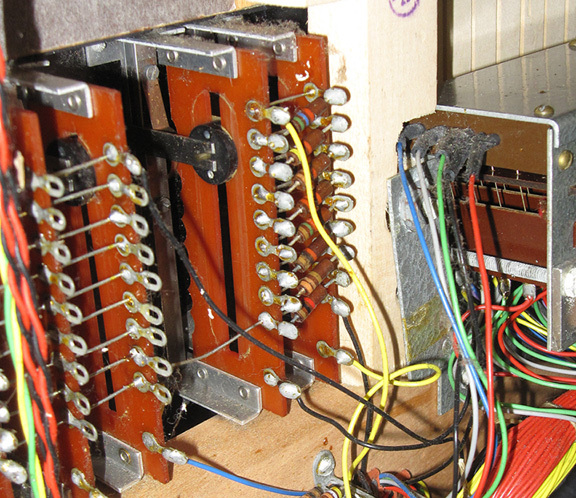 The output of the sixth, ot lowest divider on the tone generator card is roughly equivalent to the tone produced by a 16' pipe on a traditional pipe organ. In the lowest octave of the organ, the 16' drawbar is connected to the output of the sixth divider, adjusting its volume. The drawbar may be pulled out to make the tone louder and pushed in to make the tone softer. 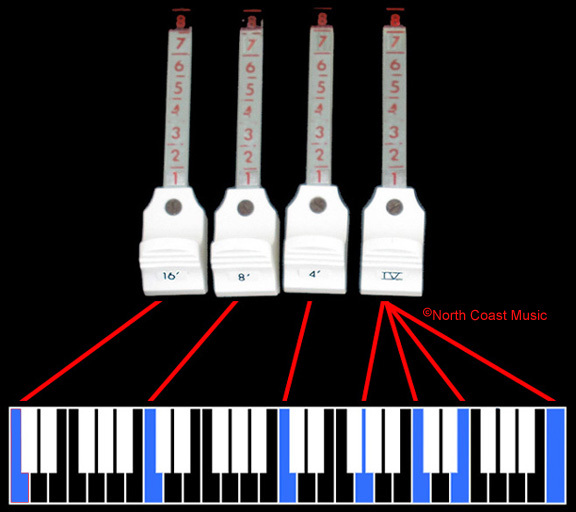 Again, in the lowest octave, the fifth divider on the tone generator card feeds the 8' drawbar, making a tone equivalent to an 8' pipe on a pipe organ and produces a tone one octave higher than the sixth divider. The same applies to the fourth divider and the 4' drawbar, which produces a tone two octaves higher than the sixth divider. 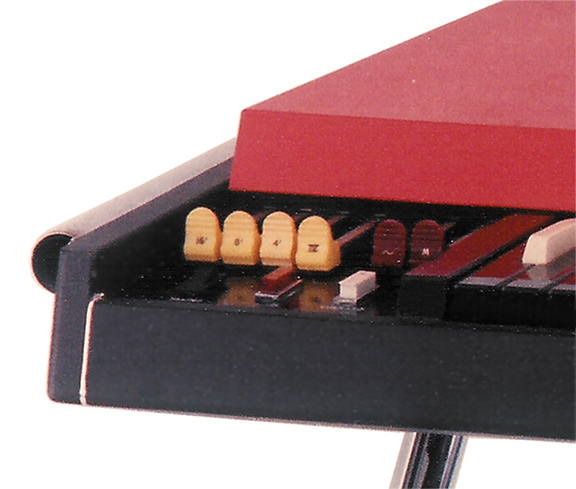 The two red drawbars adjust the tone of the organ. The left or "~" drawbar offers flute voicing. The symbol on this drawbar, "~" represents a sine wave, the visual representation of a flute tone on an oscilloscope. The right, or "M" drawbar offers the reed voicing, a much brighter tone. The "M" symbol on the drawbar is the visual representation of a reed tone on an oscilloscope. These tone drawbars may be used individually or in combination with each other. Like the white drawbars, these also act as a volume control. When pushed all the way in, the organ will make no sound, regardless of the position of the white drawbars. Under the orange lid of the organ, directly behind the drawbars, is the two stage preamplifier that prepares the output of the organ for an external amplifier. A master level control allows the total output of the organ to be adjusted to avoid input overload distortion. You might wish to purchase the Vox V301J schematic to help you repair the drawbar or preamp circuits. Parts values for all capacitors, resistors, and diodes are included in this schematic. Click here to purchase this from North Coast Music.